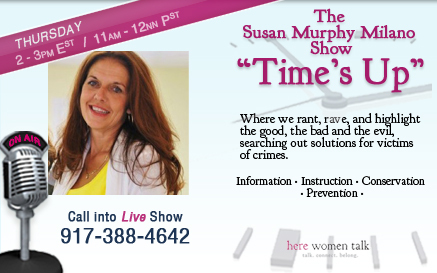 The REAL Cougar Woman, Linda Franklin, on Time’s Up with Susan Murphy Milano! November 2010. She says, “it was destiny” The whole idea started to germinate when women serving in Afghanistan emailed her saying that they read The Real Cougar Woman™ blog every day and how powerful they felt when they did. They called themselves “The Combat Cougars” and they just wanted to say thank you for the valuable information she was providing them. From that fateful day to this Linda has been committed helping all women connected to military service. Their sacrifices are many and appreciation shows has been limited. Like many women, they have fallen through the cracks. Every time Linda talks to these fabulous women, the warmth and love they show is beyond anything she could ever imagine. Their stories, their courage and their dedication is beyond anything she has ever been a part of. When Linda met the women at United Veterans Beacon House, who were homeless vets, she couldn’t understand how that could happen. Frank Amalfitano, President and CEO of Beacon House shared his knowledge and experience with her and then invited her to become a special project under the Beacon House not-for-profit umbrella. It’s a solid partnership with a common goal. This is the beginning of a long journey. Linda is dedicated to this cause and is constantly amazed by the big hearts who want to help her in her mission to help. How amazing…and how refreshing this perspective is! I can’t wait to hear more! Bring on the Cougar please!